SEPTA and police have yet to say whether a bus driver suffered a medical emergency or was distracted when their bus careened into a Torresdale home killing a man and injuring several others. A 52-year-old man spending time with his family in a kiddie pool was killed Thursday evening when a SEPTA bus jumped the curb and ran onto the lawn of a home in Northeast Philadelphia. Three members of the group were struck and pinned between the bus and the wall of a home. James Derbyshire was struck and died at the scene. A 20-year-old woman standing next to the pool and a 28-year-old man who was able to jump out of the pool were seriously injured. "There was no bringing him back," said a shaken witness, Michelle Woods, who saw the out-of-control bus and had raced to help. The crash left a hole in the house that went to its basement. Woods tried to comfort the woman. "I felt bad for the woman," she said. "She kept saying, 'Help him, help him,' and I just said 'OK, we're going to help you both.'" The wild string of incidents played out around 6 p.m. The crashes began as the bus was traveling on Morell Avenue toward the T-intersection with Frankford Avenue in Northeast Philadelphia, SEPTA and police said. The 49-year-old bus driver apparently went through a red light at Frankford and Morell, investigators said. As the bus crossed Frankford Avenue, it struck a southbound white Lincoln MKZ, then hit a red Ford Fusion headed northbound on Frankford, where it jumped the curb. The bus pinned Derbyshire and struck the 28-year-old man as he jumped out of the pool, police said. Derbyshire was from Aubrey Avenue. The 28-year-old man and the 20-year-old woman had to be rescued from under a fence and were hospitalized. Both the cars had green lights and both drivers suffered minor injuries, police said. 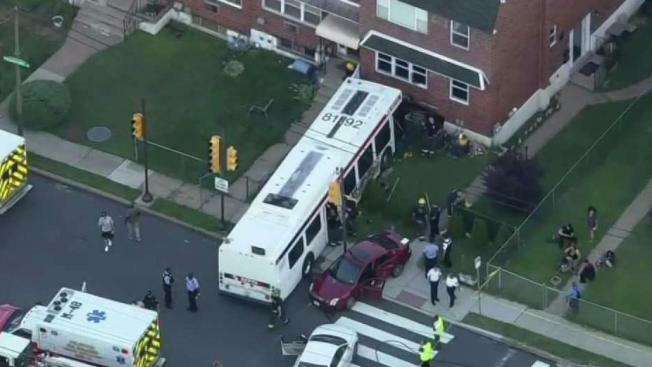 Sixteen people were on board the bus, Philadelphia police said. The bus driver and two passengers required treatment at a local hospital. Authorities have not said what could have caused the bus driver to loose control. The investigation continued as officials examined footage from inside and outside cameras on the bus.